The support for post-election reform initiatives in 2016 was the natural continuation of post-election assessment and review activities carried out in 2015. However, the ongoing process of negotiations between the government and RENAMO set the tone of the progress of public discussions on electoral reforms, as politicians and legislators alike perceived that the outcome of those negotiations would determine the shape of such reforms. 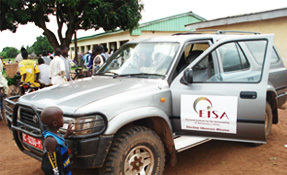 Therefore EISA was able to support only limited activities in this programmatic area. Nevertheless, the Mozambique office continued its support to post-election reform where it could, training of elected officials and support to party benches in Parliament. A matrix of electoral reform issues was developed and an implementation work-plan developed with The Carter Center. The first research papers were commissioned. On 12 May the EISA Mozambique Country Director held a courtesy meeting with the Parliamentary Committee in charge of electoral reform to exchange ideas of how the two institutions can cooperate on the electoral reform process. The Committee expressed its openness to EISA's initiatives and EISA offered to provide the new Committee members with training on electoral issues. EISA Mozambique and the Mozambican Parliament co-organised a retreat for the Parliamentary Committee on Public Administration and Local Government on electoral issues on 8 and 9 of April in the town of Namaacha in southern Mozambique. 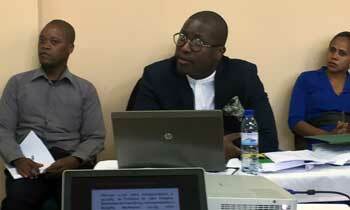 This Committee will be in charge of reviewing and revising the electoral legislation in Mozambique. Sixteen of the Committee's seventeen members attended the retreat. MPs were trained on topics related to electoral systems, models of electoral management, and the evolution of Mozambican electoral legislation from 1993 to 2014. The retreat also discussed possible innovations to the Mozambican electoral process and legislation, such as consolidating the five electoral laws into a unified electoral code, improving the results management system in order to make it simpler, more transparent and faster, the issue of extending voting rights to patients in hospitals and prisoners, and expanding the use of technology in elections, including electronic voter identification and voting systems. Presenters included the EISA Country Director, legal and human rights experts, senior EMB members, and IT experts. On 1 April the Mozambique office began implementing new activities support to political parties and elected officials as well as additional electoral reform activities. A matrix of electoral reform issues was been developed and an implementation work-plan developed with The Carter Center. Following the February roundtable, a number of expert presentations on key electoral reform topics were commissioned, presented and discussed at two stakeholder roundtables in Maputo in September and December 2015 co-organised with The Carter Center. The presentations were made by Dr Ray Kennedy, an international elections expert hired by the TCC, and Miguel de Brito, EISA Mozambique Country Director. Dr Kennedy argued that, regardless of their composition, the issue of independence, impartiality, and credibility of election management bodies in the eyes of the public is paramount, while EISA offered examples of more non-partisan models of election management where political parties can still play a role without dominating the process. Conversely, there was little enthusiasm for significantly changing the current campaign finance regulations. Both presenters stressed the negative impact of lax campaign finance regulations on the integrity and transparency of electoral processes, and offered examples of how other countries regulate both the transparency of donations, and the level of campaign-related expenditures. Local participants however, were more concerned with a timelier disbursement of public campaign finance funds under the current legal framework rather than introducing new requirements for disclosure of donations and expenditures, as well as caps on expenditures. The proceedings of these roundtables were incorporated into electoral law reform proposals to be submitted to Parliament in 2016. On 12 May, the EISA Mozambique Country Director had a courtesy meeting with the Parliamentary Committee in charge of electoral reform to exchange ideas of how the two institutions can cooperate on the electoral reform process. The Committee expressed its openness to EISA's initiatives and EISA offered to provide the new Committee members with training on electoral issues. A joint roundtable hosted by EISA, TCC and the European Union Election Observation Missions (EOMs) in Maputo in February presented their post-election recommendations to a group of Mozambican stakeholders, including the election management body (EMB), political parties, civil society organisations (CSOs), representatives of the judiciary and the legislature, and academics. The Mozambican Parliament approved new electoral legislation, including a new law on the National Elections Commission (CNE), in December 2012. According to the new law, the new CNE, the eleven provincial electoral commissions (CPEs) and the 160 district electoral commissions (CDEs) should have three civil society representatives. These representatives were to be selected from among candidates put forward by legally constituted civil society organisations. EISA, in conjunction with the Electoral Observatory (OE), facilitated the process of selecting civil society candidates for the CNE and the eleven CPEs. A total of eleven provincial civil society fora, with the participation of more than 200 CSOs, took place between mid- February and late March 2013. Out of each forum, a list of candidates was submitted to the current CNE for the selection of 3 members and 3 alternates for each CPE. In addition, EISA and the OE facilitated two CSO meetings in Maputo, with more than 100 participants to select the civil society representatives for the CNE. As a result of this process, 3 CSO representatives were selected by parliament for the new Electoral Commission among which the new Commission Chairperson, Sheik Abdul Carimo Sau, former Executive Director of the Electoral Observatory and an EISA EOM alumnus. The very slow process of electoral legislation reform led by the Mozambican parliament continued in 2012, culminating with the approval of five electoral laws in December. The process was rife with fundamental disagreements between the two main parties in parliament, FRELIMO and RENAMO with the latter voting against the approval of the laws. EISA actively supported the process from the outset by facilitating space for consensus-building among the parliamentary parties, and providing extensive and tailor-made technical input on issues where parties disagreed fundamentally. Again in 2012, EISA supported and facilitated a third retreat for the parliamentary committee in charge of electoral reform, where bottlenecks in the electoral reform process were deeply discussed with input from EISA experts. The retreat took place in March 2012 and discussed the composition and selection process of the Electoral Commission, which was the main issue of contention between the two parties. The need for timely and comprehensive publication of all Elections Commissions decisions and documentation. The inclusion of citizen observers (domestic observers) in the groups that are allowed to vote where they are deployed on election day. The clarification of the procedures for selecting the civil society candidates to the Elections Commission. The timely publication of the full list of polling stations, their code numbers and the number of registered voters in each polling station. The elimination of the necessity for a residency certificate for parliamentary and local government candidates. Through EISA's support the quality of electoral legislation improved through electoral reform workshops with the parliamentary committee in charge of electoral reform. EISA actively supported the electoral reform process by facilitating space for consensus building among the parliamentary parties and providing extensive and tailor-made technical input on issues where parties disagree fundamentally. In collaboration with the Netherlands Institute for Multiparty Democracy (NIMD), EISA supported and facilitated two retreats for the parliamentary committee in charge of electoral reform, where bottlenecks in the electoral reform process were intensely discussed with input from EISA experts. This was the first opportunity that EISA had to have an interactive discussion with the Parliamentary Committee to explain in detail some of the proposals EISA had submitted in September 2010 during a public audience in Parliament. The first retreat was held on 22 and 23 June 2011 and dealt primarily with topics such as the composition and selection process of the Electoral Commission and the creation of locallevel electoral tribunals. Three presentations were made to the committee members, namely, an introduction to electoral systems, a systematic explanation of election management models and a detailed proposal for the introduction of local level electoral tribunals. All presentations were discussed at length by the committee members, who used the workshop format to elicit clarifications from the presenters on design and implementation issues, both for the EMB and the electoral tribunals. The second retreat took place from 24 to 25 November 2011. The topics discussed during the workshop focused on detailed options for the composition and appointment of members of the National Electoral Commission, the role of the Technical Secretariat for Election Administration and its relationship with the National Electoral Commission and voter registration. EISA experts made presentations on each topic followed by intensive discussions among committee members. From 11 to 15 April, EISA and NIMD co-sponsored a study visit by three members of the Parliamentary Committee in charge of electoral reform, as well as representatives of the three parties in the Mozambican parliament, to Ghana and Mali in order for them to learn from the widely-praised Ghanaian experience with election management and from the on-going Malian electoral reform process. In Ghana, the delegation met with the Electoral Commission, who made a detailed presentation on the powers, structure, composition, selection process and independence of the body. The Commission also spoke at length of important aspects of election management in Ghana, such as the importance of transparency of decisions, access by all stakeholders to all relevant information, dialogue between the EMB and political parties and technical issues related to voter registration and voters' roll management. In Mali, the Mozambican delegation had a very informative meeting with the Commission for Institutional Reform (CARI), which is in charge of reforming the election management framework in Mali. The delegation and CARI discussed in detail the planned changes to the Malian election management structure and the different models studied by CARI in Ghana and Canada, amongst others. All parties should be compelled to submit candidates lists for parliament and both provincial and municipal assemblies that include at least 50 percent of women and the lists should be structured in such a way as to ensure that women candidates are in electable positions. At least 40 percent of mayoral candidates put forward by each party should be women. At least 40 percent of the members of the National Elections Commission and of their sub-national representatives should be women. The Mozambique office undertook an in-house diagnostic study of the challenges affecting the credibility of elections in Mozambique. The study was based on EISA 's own knowledge of the electoral processes in Mozambique, as well as on reports by domestic and international observers and by Mozambican institutions such as the Constitutional Council. 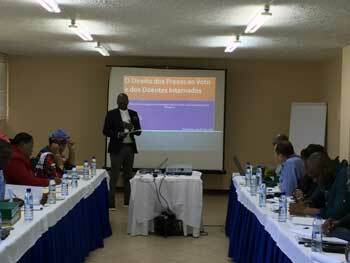 Additionally, the Mozambique office, in collaboration with the Electoral Observatory (a coalition of eight Mozambican civil society organisations working with electoral processes), facilitateda number of provincial consultation meetings with a view to collecting inputs from local CSOs on ways to improve the electoral legislation. The diagnostic study and the recommendations from the provincial workshops served as a basis for EISA Mozambique to develop a set of concrete proposals for electoral reform. Issues covered included EMB functions, structure, composition and selection, electoral dispute resolution mechanisms, voter registration and voters' roll management, gender equity, among others, and received wide media coverage in Mozambique. These proposals were presented orally at a public hearing organised by the parliamentary committee in charge of electoral reform and later as a written submission to the committee in September. EISA also lobbied the committee to allow an additional window of opportunity for public comments once the draft legislation is ready. In its December retreat, the committee agreed to add a period of public consultation to the reform process calendar after September 2011, when a draft Bill would be ready for comments. By the beginning of 2007, the main objectives of the Electoral Reform component had been achieved, and EISA Mozambique broadened it's work to include support to civil society organisations in the selection of their representatives in the new Election Management Body (EMB) and the provision of capacity-building support to the new EMB. The issue of electoral reform was not taken up again until 2010. The main objective, as far as electoral reform was concerned, was to advocate for changes to electoral legislation ahead of the 2007-2009 electoral cycle in order to improve the management of elections and enhance their transparency and credibility. To do this EISA commissioned 12 position papers and studies and used them to support 30 country wide workshops where civil society discussed proposals and developed a set of very detailed recommendations for changes to legislation. These emerged through consensus building workshops in Maputo that involved all stakeholders. After the submission of those recomendations to parliament, EISA engaged the relevant parliamentary committee and the party benches of FRELIMO and RENAMO to lobby for acceptance of these recommendations. In December 2006 parliament approved a new set of electoral laws that included the most important recommendations from civil society. A new formula for the composition of the National Electoral Commission was adopted with eight of thirteen seats allocated to CSOs. In 2005 a new set of objectives was adopted for EISA Mozambique, the first of which was to support electoral reform initiatives. This flowed from a conference, Electoral Justice and Equity, EISA in cooperation with the Centre for Democracy and Development Studies (CEDE) organised in Maputo in October 2004, which offered Mozambican civil society an opportunity to express its experiences, concerns and recommendations regarding elections in Mozambique, within the framework of electoral justice and equity. It brought together representatives of civil society organizations, state institutions (particularly those with electoral management responsibilities), political parties, academics and the media. This work was augmented in March 2005 with a post 2004 election evaluation workshop that brought together representatives from international NGOs operating in Mozambique and the main international observer missions fielded during the 2004 elections. From this came a report that was published in April 2006 that was officially requested from EISA by the ad hoc Commission for the Revision of Electoral Legislation. In November 2005, in partnership with the Christian and Islamic Councils and AMODE, EISA mozambique organised 30 workshops for public debate on electoral reform by local civil society actors in all ten provinces. EISA used this opportunity to source possible authors for research papers on electoral reform. These meetings highlighted a number of concerns and issues that Mozambicans regard as important and that play a role in ensuring the consolidating of democracy. The issues and concerns raised related to voter registration, public media coverage of elections, the relationship between elected leaders and voters, the composition of the electoral authority, electoral conflict management and low voter turnout. The result of the public debate was compiled into The Voice of the People, an un-edited volume containing opinions of the people, that was forwarded to Parliament. The volume was also given to the national experts EISA sourced, who conducted in-depth analysis of key aspects of the electoral process and made recommendations that were presented at a Seminar in June. After this seminar the experts revised their papers and an EISA where an editor crystalised the key recommendations which were then submitted to the Parliamentary standing committee responsible for leading the electoral reform debate.